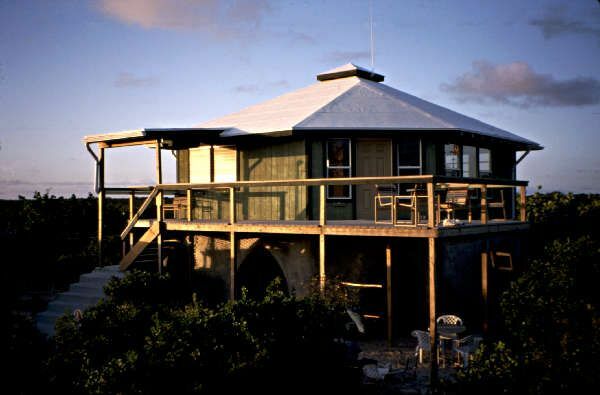 After giving our first public presentation on earthbag building, Steve and Carol approached us and invited us to the remote island of Rum Cay to teach them how to build their sand castle dream home with - well, sand! Steve had designed a six-sided, 24-foot (7.2 meter) wide structure. 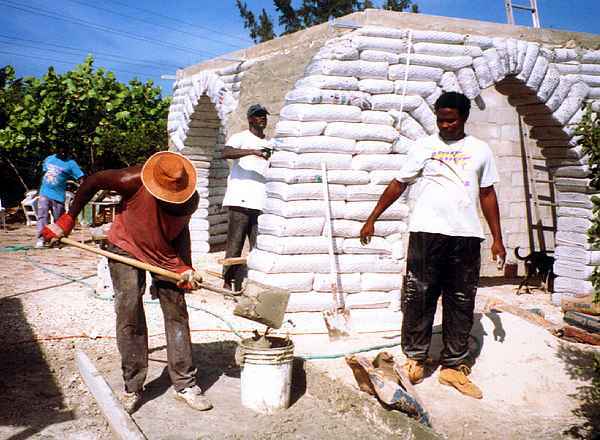 The first floor was to be built using earthbags upon which a second story, framed house would be constructed and covered with a hip-style roof. 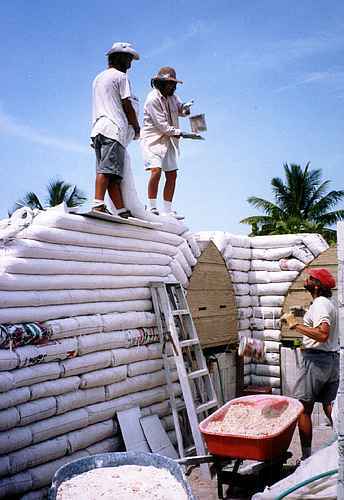 The earthbag walls are entirely load-bearing (no posts and beam) built surrounding an internal concrete block cistern designed to collect precious rainwater from the roof. 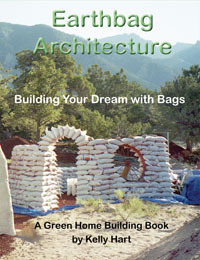 Always game for adventure and the challenge of a new earthbag building experience, we immediately accepted their offer. 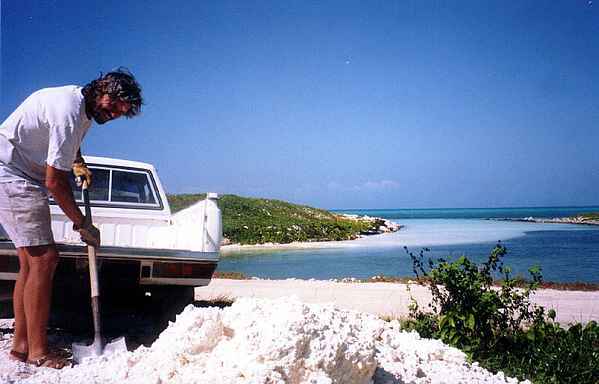 We arrived with snorkel gear instead of homemade bag stands and tampers, but soon discovered that the local dump and an abandoned hurricane ravaged dive club provided the materials we would need to construct all of our own site-built tools. The bags were filled with a mixture of beautiful white sand and crushed coral made available from the dredging operation for a nearby marina. The foundation consisted of a one foot (30 cm) deep by two feet (60 cm) wide trench that was filled with compacted rubble and coarse sand. The bag work began directly onto this rubble trench foundation. Steve (in background) cuts and digs the foundation trench. 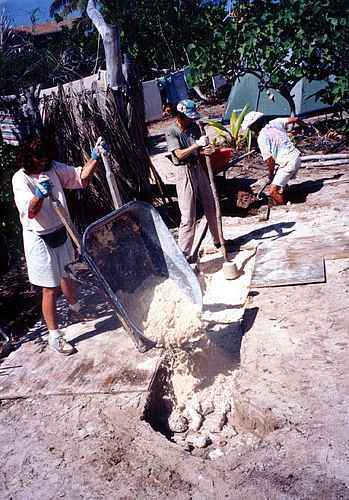 Carol (in foreground) fills the trench with coarse rock and crushed coral. Kaki (center) dampens the fill and compacts it with a hand tamper. The earthbag wall will begin on this filled foundation trench. 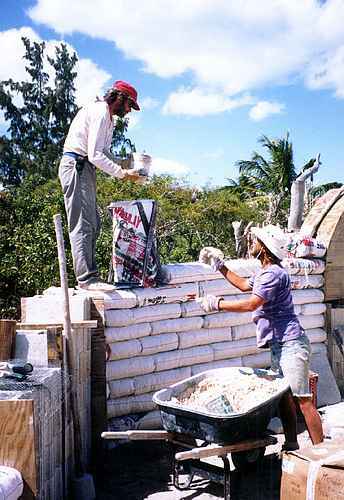 Steve tosses up cans of moist coral sand for Doni to fill in place on the wall. These extra wide bags can weigh as much as 200 pounds (89-90 kg.)! After a row is laid, it is compacted with hand tampers. 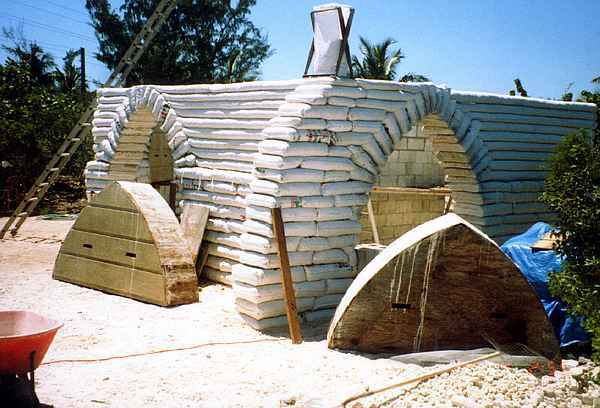 Narrower tubes were used for the upper courses of the wall except around the arch forms where we preferred to use the larger width bags for providing extra strength at the doorways. Once the walls were completed, the arch forms were removed. Our friends, Carol and Steve, basking in the delight of their accomplishment! A concrete bond beam was poured on top of the finished walls anchored to the bags with rebar and poly strapping. The bond beam ties all the walls together and provides a foundation to support and anchor the second story frame structure. Precision bag work pays off when it's time to plaster the walls. 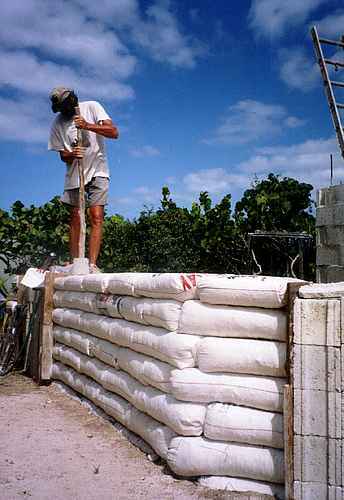 A local Bahamian crew applies a cement/lime based stucco over chicken wire. The earthbag walls were finished with two coats of a cement/lime base plaster applied over heavy gauge stucco mesh (chicken wire). 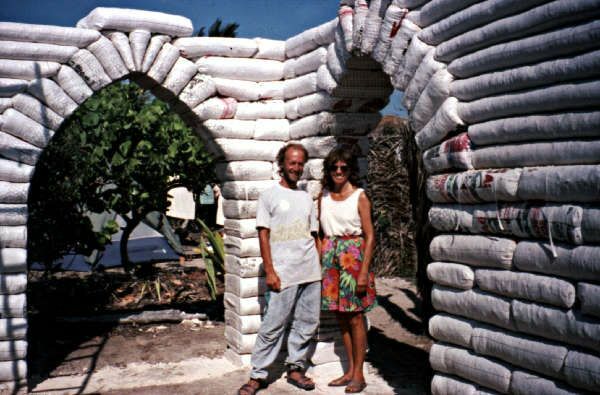 The remote location and availability of locally harvested crushed coral sands made earthbag construction the ecological and economical choice that best suited Steve and Carol's ideals for sustainable building methods in the Bahamas. To date, this building has so far endured several hurricanes without any structural damage! 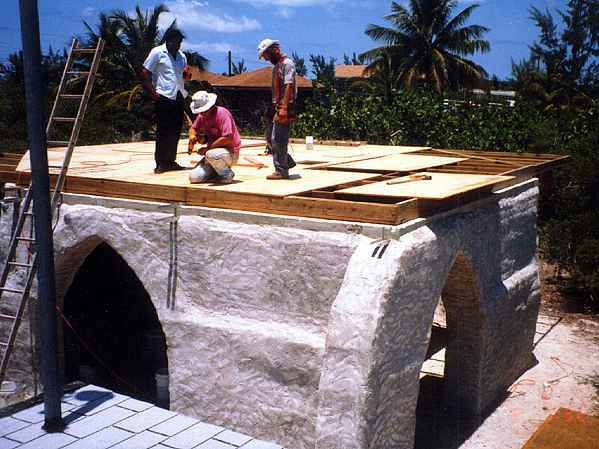 The Sand Castle as it nears completion after construction of the upper story wood frame house. The second story and wrap-around deck take advantage of the magnificent views while capturing the tropical breezes.